Maintaining the traditional floral freshness that typifies Dalwhinnie's style, this whisky is a richer, more unctuous style that's designed to be served straight from the freezer. Doing this makes the alcohol less obvious and brings out some of the sweeter notes. Perfect with after-dinner treats. Dalwhinnie Winter's Gold is a highland Single Malt from the highest and coldest distillery in Scotland. An indulgent, honeyed Dalwhinnie that is comforting, rich and sweet, with notes of heather and peat and a spicy warmth. Best served straight from the freezer. From Scotland's highest and coldest distillery that owes its rich golden character to the cold winters that shaped it. Winter's Gold makes an ideal gift as an introduction to Dalwhinnie and Single Malt Whiskies. Dalwhinnie Winter's Gold is a 2015 addition to the Highland distillery's range. It's inspired by the chilly climate up at Scotland's highest and coldest distillery. As its label states it was 'crafted by the cold'. Dalwhinnie Winter's Gold is an innovative bottling from Diageo offering a different kind of whisky drinking experience. 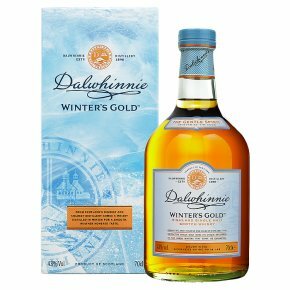 Dalwhinnie Winter's Gold is in the same vein as the 15 Year Old with aromas of flowers, honeyed with a hint of peat and green fruit - apples and fresh pear. Each sip is soft on the palate, with slightly warming honeyed fruit. The finish offers a soothing texture, as light floral notes mingle with soft fruits and just a touch of spice. Made using whisky distilled in the cold Scottish winter, it is intended to be served straight from the freezer, delivering richness and sweetness as the glass warms up. Winter's Gold is the perfect gift for drinkers looking for an introduction to Dalwhinnie and single malt whiskies.